For quick and efficient tool repair service from highly trained professionals, businesses in Wichita, Kansas, and nearby cities should turn to Wm. F. Hurst Co., LLC. Our company has built a solid reputation throughout the Midwest for being a reliable industrial supply distributor, but as an extension to our wide ranging offerings of high-quality industrial supplies we also offer professional tool repair services for a wide variety of brand-name industrial tools and equipment. When entrusting the professionals at Wm. F. Hurst to perform tool repair service on your equipment, you can rest assured that we will maintain an unwavering commitment to providing accurate and expeditious maintenance. We understand that our customers in Wichita, KS, rely on their tools each and every day to maintain a productive operation, and our technicians are determined to repair and return the tools you need as quickly as possible. To learn more about the tool repair services offered by Wm. 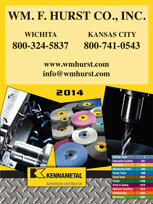 F. Hurst to businesses in Wichita, KS, and other nearby cities, contact us today. Also, be sure to ask about the wide range of industrial supplies that we have available and the benefits of partnering with a company that has been in business since 1962.